I started my first moving company at 19 years old. I started with nothing and built it into a nationwide multi-million dollar moving empire. And now I want to share all of my success strategies with you as well as my failures and mistakes to help you in your business. When I started my first moving company I had no one to turn to for the answers that I needed to run and build my business. Because of that, I had a lot of costly and stressful trial and error. 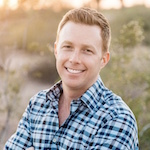 I eventually was able to create a system for starting, running and growing successful moving companies. I opened local moving companies throughout the country, hauled our own long distance moves from those locations and even opened a moving broker division for a couple of years. I know there are some really good people in the moving business. Men and women with good hearts that want to do the right thing by their customers and provide a great service. For those of you out there, allow me to be your moving business mentor. Allow me to help put powerful processes and strategies in your hands so you can book more moves and become more profitable in your business. To help you grow your companies will only give the public better options when choosing a moving company and they will receive the quality moving service they deserve. I believe it’s those of you out there focused on your customers that will help rebuild the reputation of our industry. That is my mission as a moving business mentor. From my brief time as a moving broker, I met some really great moving company owners that were focused on providing a quality service. I also came across some moving company owners that were not really concerned about customer service at all. I hope to share with them the importance of customer service and the realization that the only way to build a real business that will thrive is to focus on your customer. (In this episode I share the legal trouble that I experienced from becoming a moving broker). Marketing strategies for your moving company. How to book more moves for you moving company. How to become more profitable in your moving company. How to hire amazing employees. Ways to improve the quality of your service for your customers. How to spend more time working ON your business and not IN your business. How to work fewer hours, while reducing stress and increasing profits. Basically, I will be sharing everything I did to start my first moving company with 2 rental trucks and grow my moving businesses to $20 million a year in moves. 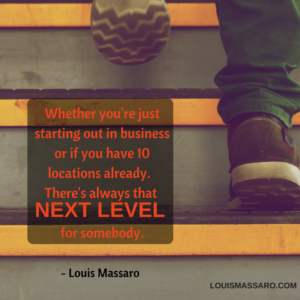 Whether you are just starting out or you have a very successful moving company with multiple locations, there is always that next level for everybody! 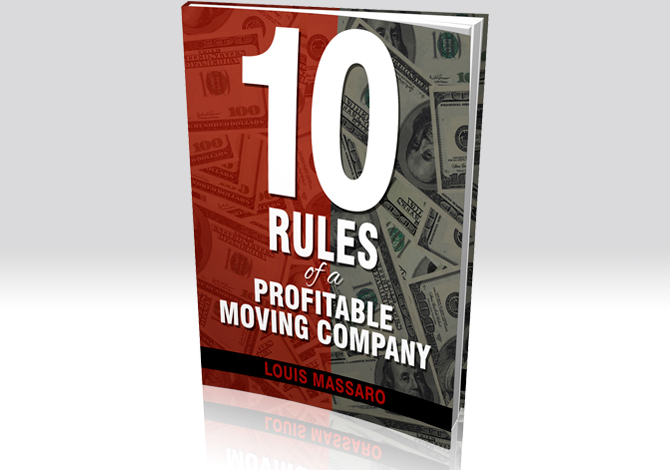 Hey, my friend, it’s Louis Massaro, author of Ten Rules of a Profitable Moving Company, and founder of Moving Mastery. I wanna welcome you to the first video in a series that I’m putting together on the moving business, where I’m gonna be sending out weekly content on how to help moving company owners just like you profit in business and thrive in life. You see, I started my first moving company when I was 19 years old. I was a little 19-year-old kid. I had no money. I rented two trucks that I kept parked in the truck rental yard. I’d drive there every morning to dispatch my crews. Half the guys that I tried to hire thought I was a joke. Here I was, this young kid working out of a truck rental yard, and I was interviewing ’em in my car, trying to hire great guys to come work for me. And it was tough. It’s a tough business to be in, and to get it started with, really with nothing, with two rental trucks, some advertising, and answering and booking all the moves from my cell phone as I drove around and went to apartment complex and apartment complex, trying to round up business and build a little referral network, it was a struggle. But eventually I built a little system. I was able to move into an office and buy some of my own trucks, and within a couple of years, I had a nice system that I had perfected around local moving. And I started to expand, and open up offices nationwide. And before long, we had quite a business going. And I say this because I wanna put it in perspective of what’s possible, and that’s a lot of what these episodes are gonna be about: How to grow your business, how to expand, how to make more money. But at the same time, I also wanna help you avoid problems, because that’s a really big thing for me, because as I grew, and as I went through the 2008 recession, and at that point I had offices all around the country, and the recession came, and it was tough, and I stumbled, and it was a big setback. I almost went bankrupt. We had trucks, 60 trucks, and advertising, and warehouses, and employees, and it was tough when that time came. And it was something that took me a year or so to bounce back from, but when I did, I bounced back stronger than ever, and decided that I was gonna start brokering moves. I was gonna sell my long-distance trucks, and broker moves. I thought it was a great plan at the time. I figured if all I have to do is focus on selling, and I could find someone else to service these moves, it’ll be great. So I did that. I sold my long-distance trucks, I started brokering moves, and what I realized before long is that it wasn’t the same as when we used to service our own moves with our own trucks, and now we’re relying on other people, and not all of them had the same values that we had, and they didn’t treat the customer with the respect and integrity that we did when we did our moves. And we had a move that a shipper got into a dispute with the carrier, the carrier wouldn’t unload their stuff, that move turned into an , and four years later, as we were doing 12,000 moves a year, I ended up to charges for running a brokerage business. And even though all of our paperwork was right, it just led to that. And at the time, I saw it and I looked at how many complaints we had versus how many moves we did, and I just thought that it was such a low amount, and I didn’t understand why I was involved in this legal situation now. And as I went through that, and as it’s now behind me, and I came out of it, and my local companies were still good, I realized that it was based on just poor decisions that I made, and a decision to try to take the easy way by brokering moves, and not having the control over it. And I look back at that, and it was a mistake. And I don’t wanna see anybody else make that mistake, so as I went through this whole process, it dawned on me. I’m like, “You know what? I wanna help as many people as I possibly can.” Because when I came up in this industry, I was 19 years old. I started my business in 2000 and I had nobody to turn to. I read a ton of books, I had some mentors, but nobody that had really ever been there in this business to guide me and help me make the right choices and the right decisions with my business. I learned so much from trial and error, and making mistakes, and coming back from those mistakes, and it was time-consuming and it was stressful. And if I could help you not make some of the same mistakes that I made, and I could share all of the success that I had, and all of the sales and marketing and operations, strategies and processes and procedures, that’s what I wanna do because, you know what, I look back and I look at when I was starting in the business, and if I had someone to share how they did it with me, I might have not have done it exactly how they did it, but it would have shed some light on certain ways that things could be done. And that’s what I hope to do for you. So that’s what these videos every week are gonna be about. It’s gonna be about me be sharing some information, and you taking what you want from it, using it or not. It’s not that my way is the right way, and I’m not sharing this information to prove how much I know. It’s not about that. It’s more about, how can I help? How can I serve and help you create a better business? ‘Cause you know what? This is a tough business. The moving business is tough, everything, from your employees to the customers. You’re dealing with people in one of their most stressful times, and you have to deal with who’s showing up for work, or trucks breaking down, do you have enough money for marketing. It’s tough, and I’ve been there, and I know what’s like. And if I could help somebody get to that next level, to where it’s not as stressful, and there’s more money coming in. Because I believe that you can’t just profit in your business. My motto is profit in business and thrive in life. You need to have systems in place, processes in place, checks and balances, and ways to make sure that you could have a profitable business but you’re not there 80 hours a week. To where you could work on your business and not always be in your business, to where you could take some time away and enjoy your life. And in this business, if you’re gonna own a moving company, if you’re gonna be in the moving business, there’s a lot of responsibility, there’s a lot of liability, and it’s a lot of work. You deserve to make a lot of money. If you do a good job, and you go out there every day, and you service the customers the right way, and you create raving fans, you need to make a lot of money in this business, or it’s not worth it. It’s tough, it’s a tough business. So that’s really my mission. I know that there’s good movers out there. As a broker, I dealt with a lot of companies across the country, and I know there’s some really, really good-hearted people out there that really wanna do the right thing. And I know that some of them struggle with some of their sales processes, and their marketing processes, and just structuring their business, but I know that if they had those processes in their hands, and they had some of the sales and marketing strategies, that the public would receive better service because they would get more moves. And I know there’s a lot of good movers out there, and I know there’s some bad movers out there, too. And I know there are some people that customer service might not be their top priority, but it might not be because they’re bad people. They might just not know a better way of doing it. So listen, I’ve run moving companies all across the country. I started a brokerage division, which I wish I hadn’t done, but you know what, it led me to this. And I wanna be of service to you, I wanna help you build your business, grow your business. I’m gonna be doing weekly videos just like this, but we’re gonna talk about specific things that you could implement in your company to help you grow, to help you get to that next level. Because if you’re just in this to make a living, I challenge you to set your sights a little higher, because you can make a lot of money in the moving business, and that’s what you should wanna do, because again, it’s tough. 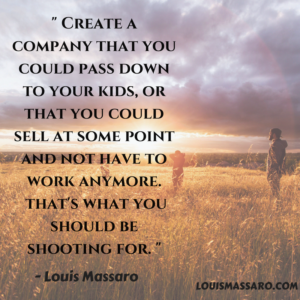 So if you can create a company that you could pass down to your kids, or create a company that you could sell at some point and not have to work anymore, that’s what you should be shooting for. So I don’t care if you’re just starting out. I don’t care if you have 10 locations already. There’s always that next level for somebody. So if I could share some information to help inspire you to get to that next level, that’s what I wanna do. So if there’s anything, any videos, any topics, anything you need help with, leave comments, let me know, I’ll do a video on it. I’ll be more than happy to help you. 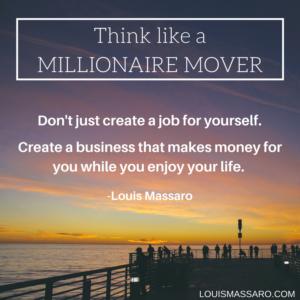 If you’re not signed up for my blog, head over to louismassaro.com, sign up for my blog. I’m gonna be sending out weekly videos, information on the moving business, information on business in general, on mindset, how to get yourself in the right mindset to get to that next level, how to think like a millionaire mover, and not just create a job for yourself, but create a business that makes money for you. So sign up for my blog. I’m gonna be on social media, Facebook, Instagram, LinkedIn. If there’s anything I could help you with, please leave me a comment, let me know. I’m gonna be sending out these videos for free, and, listen, I’m honored to be able to help, and I’m here to serve, so let me know what I can do, let me know what you need help with, and I’m gonna be more than happy to do a video and help you out. So thanks for checking this out, go out there, profit in business, thrive in life. I hope to see you soon.